Today the warm temperatures will spur the bees to make cleansing flights. The bees will fly out and defecate and fly back into the hive. Many of the bees will flyout and drop in the snow and die. This activity is normal. Bees start winter with 50,000 bees and by late February are down to around 20,000 bees. So there is attrition over the winter. This warm weather makes it easier for the bees to move around in the hive and reposition the cluster. Hopefully they will be ready for the cold blast coming late this afternoon. Nature's Nectar LLC will be getting two deliveries of bees in April of 2014. The price of package bees will rise quite a bit in the 2014 season. Beekeepers can expect the cost of package bees to rise around $15.00 per package. Bulk honey prices in 55 gallon drums have increased from $1.85 per pound to $2.30 lb. 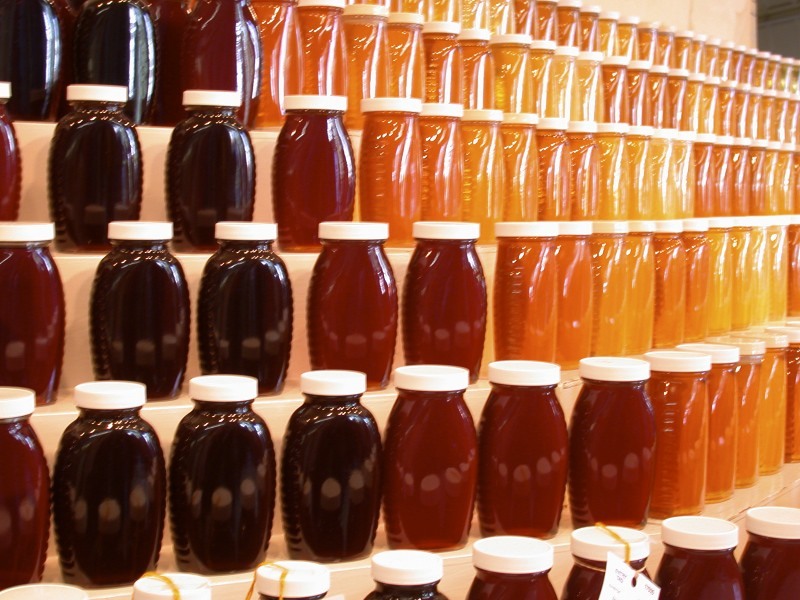 There is speculation that honey prices may hit $3.00 lb by spring. I have noticed higher honey prices in grocery stores. 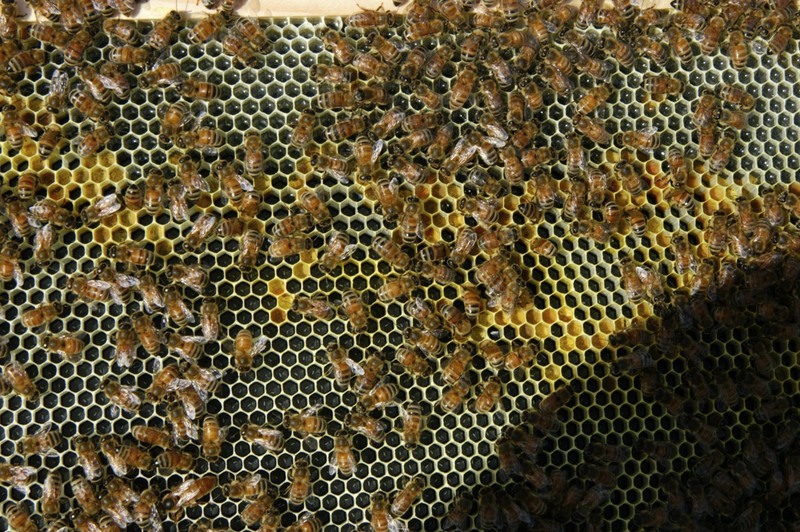 Many bee producers will be running more colonies instead of selling large quantities of bees. An example: A commercial beekeeper running 1000 hives with a 100 lb average will get almost $250,000 for that crop. More if the price rises and if they have a higher yield. To get a higher yield the simple answer is to have more bees. The price of bulk bees has gone up by 50% from last year. When package bee suppliers shake bees for packages they weaken their colonies. These weakened colonies will produce less honey as they move to other states for honey production. Almond pollination is around $150.00 per hive. Example: A beekeeper with 1000 colonies can expect $150,000 for his pollination contract. I should have the firm price and be mailing out order forms by mid January. There have already been many calls for package bees and I expect the demand for the package bees to be very strong. To make sure you get the bees and the delivery date you want, order early. Check overwintering colonies in early February to determine their alive or dead status. Wendy and I would like to wish everyone a Merry Christmas and a Happy New Year to all our friends and their families. I hope everyone covered their bees. The cold weather is testing the genetics of the European Honey Bee. The European Honey Bee is found on every continent except Antarctica. They are as mid spread as the human race and have proved time and again how adaptable they really are. The current cold weather should not be a problem with the bees. 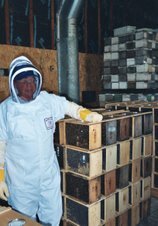 The few things that beekeepers do for their bees such as covering their hives, locating them in a windbreak of trees or hay bales, having a young queen that has not gone through a winter yet, treating for varroa in August, and having enough food. Having provided these things for the hive will greatly increase the odds of survival of the colony. Take away one or more of the wintering to do's and the odds of survival will be more challenging. Honey bees are amazing creatures and their will to survive never ceases to surprise a beekeeper.What a thrill it is when we check our hives in February and find the bees alive and well. Many beekeepers are feeding their bees right now. The race is on to get the feed on right now before it gets cold. The syrup fed in the fall is 2 parts sugar and one part water, or a beekeeper can feed ProSweet. The bees have to convert the sugar water to honey and take the moisture out of it. With ProSweet the bees take it down and put it in the cells on the frame and done. ProSweet will not ferment or granulate. Adding ProHeath a feed additive will make the syrup more attractive to the bees and is a health aide for Nosema. 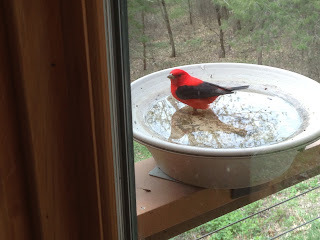 This time of year two feeder pails can fit above the inner cover straddling the oblong hole. Giving the bees as much feed as the bees can take makes the feeding go faster. 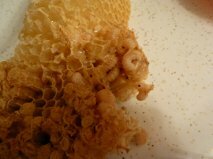 I have been extracting my honey and should be getting to the end in the near future. I have had the honey in my honey house for a week drying it down before I extracted it. Most of the honey samples beekeepers have bought to me to test for moisture have had low moisture levels. I have seen some higher moisture levels of honey that has come in late. Most of this hasn't had the time to ripen and beekeepers had to take it off to feed or add mite treatments. The nectar flow seems to be over. The bees have switched to robbing any open morsel they can find. 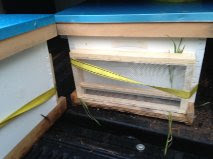 A fellow beekeeper and myself hauled about thirty supers out of my honey house to load into a truck. Five minutes with the supers not covered in the back of a truck, a cloud of bees developed in short order. With any movement of honey, the boxes should be covered or moved quickly. The supers we moved were taken to a beeyard and the supers were placed on top of the inner covers. The telescoping covers were then placed on top of the supers. This way works great for the bees to clean all the supers with no robbing. Wet supers just placed in a beeyard in the open for the bees to clean up leads to robbing behavior. Once the bees are done with the supers they look elsewhere to rob honey. The bees can turn on a healthy hive and overcome the bees and rob out the honey and kill the bees in the process. A whole beeyard can perish with this robbing behavior. The nectar flow is pretty much over for most beekeepers. Dry weather has really dried up the nectar producing flowers. Pulling supers and extracting honey is what is going on now. Getting mite treatments on should be done at the same time. Supers off - mite treatments on. Extracting honey, spin out the capped honey and the uncapped honey separately. The uncapped could have a high moisture content and it is wise to have their moisture levels checked before the honey gets mixed together. The moisture is checked with a small sample of honey on a refractometer. 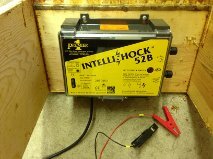 I have one here in my shop and check moisture levels for free. Apiguard is Thymol gel. It comes in shallow tins. A 1-1/2" shim is needed to raise the roof so the bees can get at the Thymol Gel. One tin is placed on the top bars of the top box. Two weeks later another tin is put on the top bars. Easy to use. Temperatures have to be above 60 degrees to work properly. Hopguard made from Hops. Cardboard strips drenched in the miticide liquid. Treatment is two strips per brood box once a week for three weeks. Can be used at any temperature. The boxes have to be lifted off one another to put the strips in. 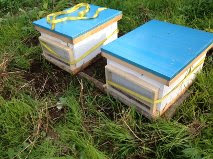 Miteaway quick strips (formic acid) Two strips per hive for one week. Temperatures need to be 60 - 84 degrees. An organic respirator is required to put the strips on. Apivar two strips per box for 6 weeks. Feeding If a colony is short on stores feeding needs to start right away. 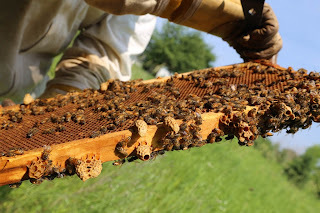 A beekeepers can't feed with Apiguard or Miteaway on the hives. When feeding a mineral oil supplement such as ProHealth should be added to the feed. 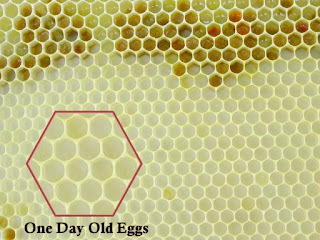 Some beekeepers have been using this to prevent nosema in their colonies. Goldenrod is in full bloom around the metro. The Goldenrod in my wife's flower garden has large heavy heads. 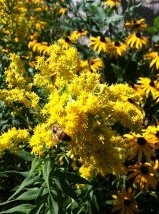 I swear every pollinator in Washington County is in my yard working the Goldenrod. The bees are loving it. A beekeeper stopped in my shop today, he extracted his honey last week. He put his wet extracted supers on top of the inner cover for the bees to rob out any nectar that was left. He went to check on them yesterday and found the bees were putting honey back in the supers. So he had to put the supers back on and he is hoping to get one to two supers of honey off the goldenrod. Using a brush to remove the bees from a super. Using a fume board with Honey Robber. You can use Honey Bandit or Fishers Bee Quick. All of these work the same. The trick is to pull honey when it is hot out. In my opinion the Honey Robber works the best and is the least expensive. The Honey Robber is offensive to some beekeepers, the Honey Bandit and Fishers Bee Quick are more pleasant (odor) to work with. Master Beekeeper Bob Sitko and Beekeeper Mike Wybierla explaining how to pull honey. 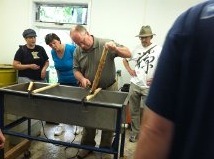 Our annual extracting workshop was Sunday. 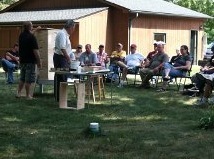 Fifty beekeepers attended. It was a great time with everyone able to try a hand at uncapping frames of honey, extracting, filtering and bottling a jar to take home. The moisture content of the honey that we extracted was 16.4 percent. Very low moisture. I have noticed Goldenrod starting to bloom around town. It should last around two weeks. Hard to say if it will be a nectar producer or just a pollen producer. Right now the nectar flow has slowed around the metro and hopefully there will still be one more super to fill. The top deep box should be pretty much full of honey right now. If the top deep only has a couple frames full of honey, supers should now be removed and feeding should start, the bees need to fill the top deep box with feed for the colony's winter stores. Feeding colonies now that are low on winter stores must start now to give the bees enough time to put enough food away. Feed 2:1 sugar syrup, 2 parts sugar to 1 part water heavy syrup or feed ProSweet. Once the temperatures start cooling off as fall comes on, the bees slow their ability to take down large quantities of feed. We will show how to pull honey using various methods. Everyone will be able to uncap honey, spin frames in an extractor, filter and bottle honey. Also how to treat for mites and prepare a hive for winter. This workshop is limited to 50 beekeepers, please no children. Please call and reserve a spot. Now is the time to get some honey for the state fair. The fair is a great way for beekeepers to show off their product to the general public. This year the Ag Hort building is being remodeled and will be a huge draw to the fair goers. Your entry in the fair helps promote the honey industry. Your family and friends have patiently listened to you talk about your bees all year. Now it is time to show your stuff at the fair. Go to the Ag - Hort - Bee competition page. Check out the Ag Hort Bee premium book. Under the Bee and Honey section there are many classes to enter. If you have never done this before there is a novice entry class. I strongly encourage beekeepers to enter. It is fun, you may win a ribbon. Read and follow the directions for the class you are entering. All the ribbons pay an award and you will have award winning honey, the best in the state. The nectar flow has slowed down. There are still nectar flowers out there and the bees are still bringing nectar in. Some areas around the metro are better than others. Some locales the nectar flow is down to a trickle. I have heard of most beekeepers have had a very good flow so far and there is still more to come. Goldenrod is going to start blooming in the near future. The flow from Goldenrod is always a little iffy. 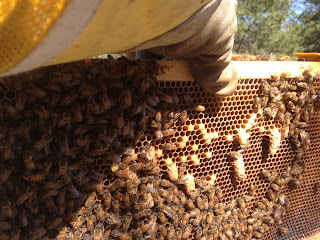 The flow can be very good with one to two supers of honey coming in or hardly any honey in the supers. 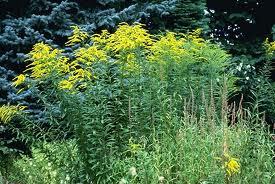 The Goldenrod flow hits when hives are in peak population and it is about the only show in town. The bees totally focus on this plant for honey and pollen. You know if Goldenrod nectar is coming in because the bee hives smell like wet sweat socks. While this may concern beekeepers their honey will smell bad, this oder goes away as the honey ripens. 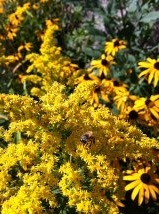 Goldenrod honey has a nice mild flavor and is sought out by people with fall allergies. There is supposed to be a decent rain tonight. The rain should keep the flow going. Treating for Varroa in the month of August is critical for the hive surviving through the winter. 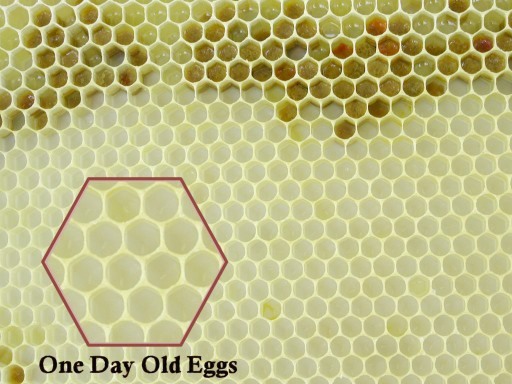 Varroa builds up with time. The bees that are being parisitized by the mites are weakened and can become victims of viruses over the winter months, causing the hive to die before spring. Treating in August gives the bees time to go through a couple of brood cycles before winter. The new bees have not been victims of the Varroa parasite and are much healthier going into winter. Treating in Sept makes it harder for the bees to turn out enough healthy bees before winter. Using Formic Acid or Hopguard works great for keeping the supers on and treating for the Varroa mite at the same time. This will let us have the supers on later to take advantage of the Goldenrod flow which will be late, like every nectar flow so far this year. This coming weekend is supposed to be cool. This is a perfect time to treat colonies with miteaway quick strips with the ingredient called formic acid. This is a fumigant that kills Varroa. The cool weather lessens the initial intensity of the vapors. if the weather is too warm it can kill some brood. Miteaway quick strips is a seven day treatment and can be used when the supers are on. The dose involved is the same amount as a food additive and is perfectly safe with the honey supers on. The strips need to be removed if the temperature are going to be over 85 degrees F. the first three days of treatment. The labels says a respirator needs to be worn when using Miteaway qwik strips. Always read and follow the label before using any miticide. Hopguard is a miticide that comes from the Hops plant. Hops are used for making beer. Hopguard can be applied when the honey supers are on. Hopguard is applied with cardboard strips. The strips come in a foil pouch that has the liquid miticide in the pouch. Each pouch has 50 strips. The directions on the label is a little confusing and has led to improper applications. The proper dosage is two strips per brood box. One brood box two strips, two brood boxes four strips, three brood boxes six strips. Treatment is over a three week period of time. The strips are put in for one week. Then another set for one week, then one more set of strips for the third week. This kills Varroa through a full 21 day brood cycle. Right now I see Spotted Knapweed in full bloom around the metro. Also Purple Loosestrife is blooming in swamp areas. Both of these are noxious weeds and should not be propagated. But having said that, they are both great honey plants. Purple Loosestrife honey is a greenish color and looks like new motor oil. Both plants make nice tasting honey. 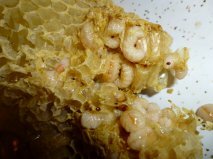 This blog has good perspective from a new beekeeper. He has had some glitches along the way but was able to get through them just fine. Dealing with a swarm your first year is always challenging but he made all the right decisions. The pictures are great and add a lot to his beekeeping venture. This nectar flow is proving to be a big honey crop. I have been talking to beekeepers coming through purchasing more supers. They all have been saying their hives are full of bees and the honey is still coming in strong. I do think this nectar flow has some staying power. We are coming up on the second cutting of hay. Alfalfa produces more nectar this time of year than at any other time. The ground still has good moisture and our honey plants are still looking great. 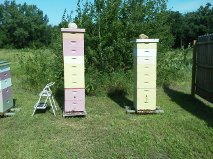 Here are some pics of some beekeepers hives. Most of the hives started as packages this spring. More Than Honey moves from the Lagoon Theatre to the Edina Cinema and runs from July 19th through July 25th. After that it is gone. Milkweed, Spotted Knapweed, Vetch, many other flowering plants. The nectar flow is still going strong and seems that it will keep going a while yet. If the honey supers are filling up, put on two more supers and the bees may fill them up. Several new beekeepers have stopped in and purchased more supers. They were surprised to get honey their first year. Most beekeepers should be getting four supers of honey or more this season. This movie is playing at the Lagoon Theatre in Mpls. It has a very limited engagement. See it before it is gone. We have been talking to beekeepers coming through our shop. The nectar flow seems to be flowing very well with many beekeepers stopping in and getting more supers to keep up with the flow. A beekeeper from Hudson, WI stopped by to get more supers. He says he will need a ladder if he has to put on anymore supers. Many nectar bearing flowers haven't even bloomed yet so the nectar flow will last for a while. Some new beekeepers think that they won't get any honey their first year. This year everyone that has a good population of bees and their bees have not swarmed will get honey. Beekeepers will find that two supers will not be enough and will need more supers to hold their honey crop. 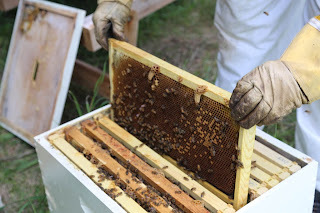 When looking at supers on a hive, if the bees are in the second box and drawing comb and nectar is starting to get put in the cells, two more supers need to be put on. New supers with foundation need to put on directly above the brood nest. Bees have a hoarding instinct. If there is room to store honey they will work to fill that room. Supering ahead of the bees will give us all a super honey crop. 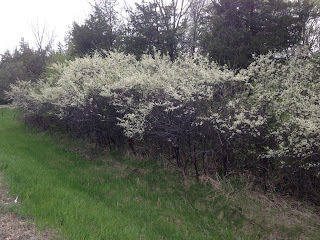 I did spot white sweet clover blooming yesterday. White sweet clover is the major honey plant in this part of the state. Right now every beekeeper should have all their brood boxes drawn out and have honey supers on. We are done feeding syrup. Supers have to go on. The bees will plug up your hive with honey and they will not live through the winter if you don't put on the honey supers. If the supers are new foundation you might want to hold off on putting the queen excluder on. Once the bees have a little drawn comb and nectar going in the supers the queen excluder can be slipped in then. Supers go on two at a time. When drawing foundation in supers they should always go on right on top of the brood boxes. If using drawn out supers, they can be stacked on as needed. Stay ahead of the bees, supers can get filled up very quickly. Check them weekly. If one is done and they are working on the second box, throw on two more. 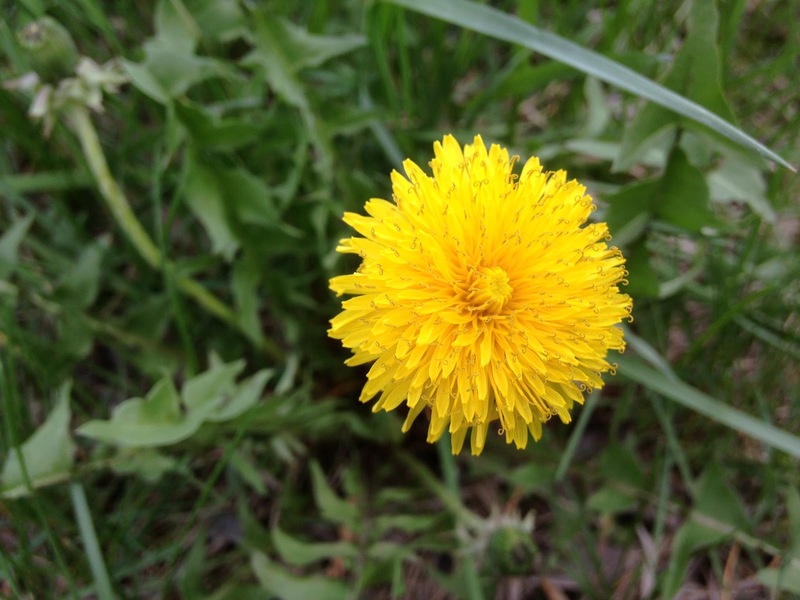 What I see blooming in the ditches, yellow sweet clover, birds foot trefoil, red clover, sumac, Basswoods are just starting. Everyone should be experiencing a nectar flow at this time. Swarm cells can happen anywhere on the frame. Usually they are on the bottom of the frame, sometimes they are on the top bars, sometimes in the corner of the frames. I moved two hives this morning and put my queen bank hives in another beeyard. Woke up at 4 am to move the hives before the bees started to fly. I took advantage of the cool morning and all the bees were clustered and not flying. I tried a new product, a moving screen. This screen fit perfect on the bottom board and is easily pulled tight with a ratchet strap. 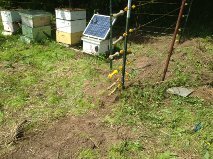 I had the bottom board attached to the deep box with hive staples. So the move went fast and easy with no disasters. I was in Chaska at my day job and stopped for gas at the Kwiktrip on 212. They have some small Basswood trees and I noticed the flowers were just starting to open. 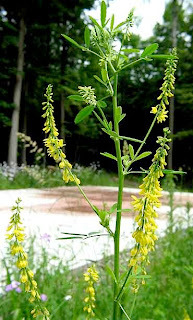 On the drive home I saw yellow sweet clover blooming everywhere. The nectar flow is coming to hive near you so get ready. We need some warm days and warm nights with no rain. We are sold out of queen for 2013. I was out in my beeyard and most of my colonies that I had drawing comb have finished their job. I now have done a full reversal. Top box to the bottom, bottom box to the top. What this does is it puts the darkest comb on top and the bottom box more than likely has pollen stored in the frames. 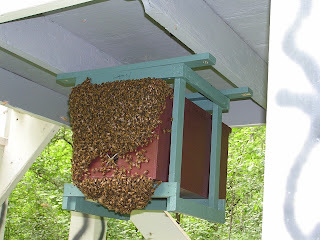 When the main nectar flow starts the bees will fill the new top box of the hive with honey. That will be their winter food stores. 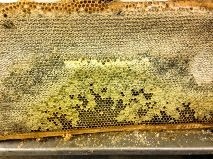 The top box now has pollen in the comb. The bees will cover the pollen with honey. 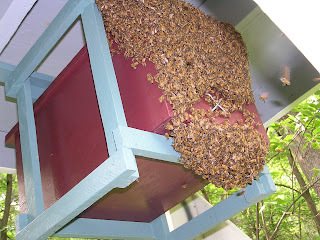 The bees move up into the top box usually in January. 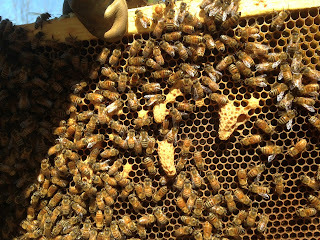 When the queen begins laying in the top box the bees would have uncapped and exposed the pollen under the honey. The bees will now have natural pollen to feed the brood in February. 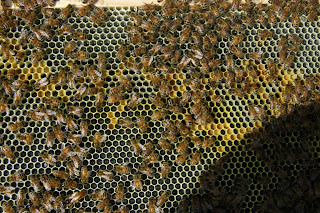 Also the bees move up on to dark comb much better than new white comb. 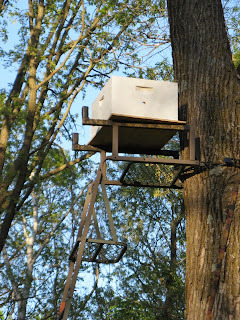 One last note, if a beekeeper goes out to do the last reversal and the top box is very heavy with honey it is too late to do the reversal and the hive should remain as it is. 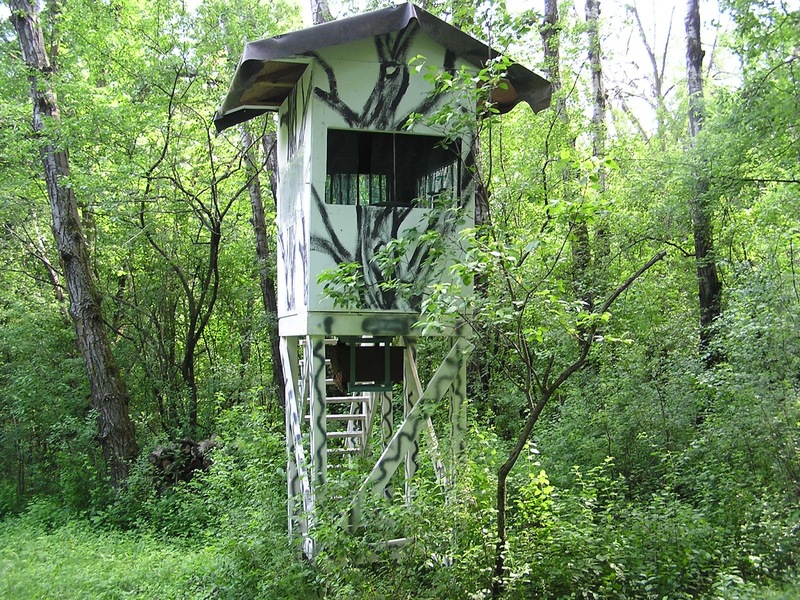 Bob Sitko put a bait hive up under his deer stand. The hive is about 8 feet off the ground. 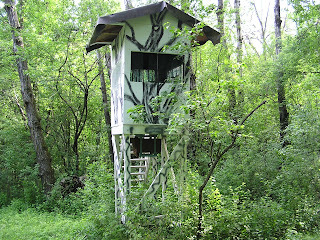 He had frames in the bait hive and used lemon grass oil as an attractant. Lemon grass oil is also in ProHealth with also very attractive to the bees. The bait hive was up for around a week. The pictures show it was a big swarm. He took the box down and had to put the bees in a two deep hive right away because there were so many bees. I have been working in Chaska lately. The drive to and fro has given me time to scan the ditch for flowers in bloom. Yesterday I saw some Bird's FootTrefoil blooming. Today there was a very small amount of yellow sweet clover starting up. These plants will spread across the metro. spotted. 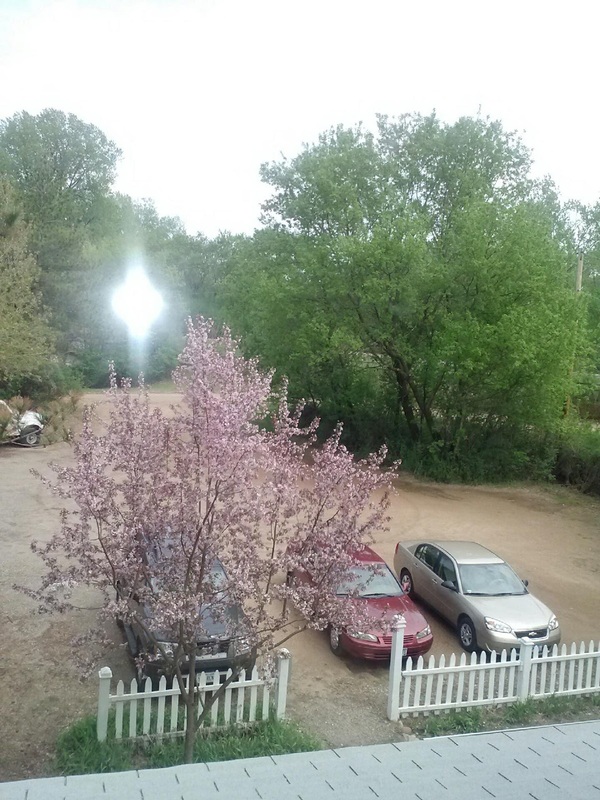 That put the nectar flow at least in Chaska at around July 1st. Supers should be on now or in the very near future. 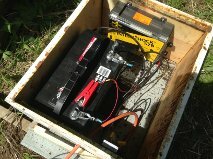 12 volt fencer mounted in a deep hive body. Closed up fencer with the solar panel on top. There is a black switch on the front to turn the fence off. Wendy and I spent a morning cleaning the bee yard and restringing some fence wires. I also had to upgrade the gate. So the whole fence got an upgrade. Wendy was working the shovel and rake smoothing the edges of the yard so the fence wires were not touching the ground. We both found where all the wood ticks were hiding. Wendy and I put in a new bear fencer. It is 12 volt and as I can attest from personal experience, if you touch the fence when it is hot, it WILL HURT. I swear it felt like 10,000 volts. This 12 volt fencer puts out 2 joules of power. 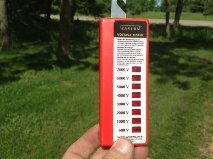 Most 6 volt solar fencers put out .15 joules or less. More joules means a better shocking experience. This fencer uses less power when it is not weedy. If it gets weedy and the weeds are touching the wires it will still deliver the hefty jolt but battery consumption increases. The 30 watt solar panel keeps the battery charged. A solar power controller stops the battery from overcharging. I hope this will keep Yogi at bay. I am sure on his next visit, he will be shocked to see the changes in my bee yard. The warmer weather has kicked up swarming into high gear. Swarm control is now on the front burner with hive inspections at no more than 10 day intervals. Miss taking out a swarm cell and it is Sayonara to the field bees. Bees have been building up nicely with everyone should have their second box on by now and many beekeepers in three deep hives have put on their third box. The temperatures are quite warm most everyone should be able to remove the entrance reducers at this time. Leaving them in can help start swarming. When the boxes that were drawing foundation are done being drawn or close to being drawn out, honey supers should be put on the hive. First year beekeepers who have been told they won't get honey their first year may be in for a surprise this year. Honey supers are put on two at a time. When a nectar flow starts, a hive can fill and cap a super in a little less than a week, if the flow is intense. Overwintered colonies should have supers on now. I talked to a beekeeper who was surprised to have a super of honey already. I commented that he probably lives near a good stand of Black Locust trees and the bees are really bringing it home. The main nectar flow looks like it is still out two weeks yet. The farmers in the Stillwater area have just started cutting their first crop of hay. Two weeks later than normal. So Alfalfa should be blooming now. I have not seen any clover blooming yet. My Basswood trees have opened the seed pods and the flower heads are unopened at this time. 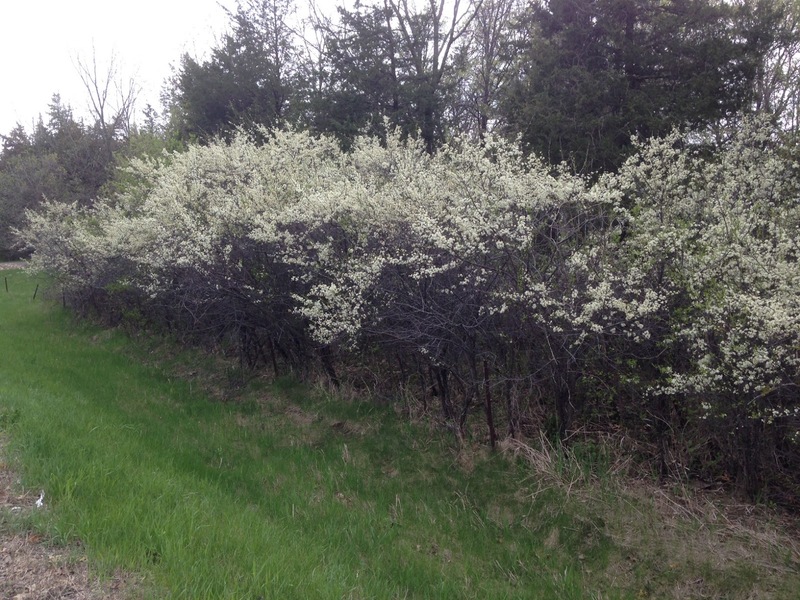 I think around first week of July for the Basswoods to bloom. With the delay of the nectar flow the bees have been able to build up stronger than a normal honey year. If the nectar is a decent one, there should be a bounty of honey for all. 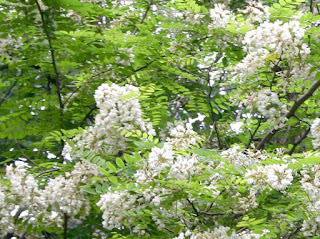 Black Locust trees are blooming across the metro area. Black Locust trees produce very nice honey and the bees can pack it in. Alfalfa should be blooming now. Farmers should have cut hay around the first week of June. The wet weather has prevented them from cutting the hay. Beekeepers benefit from the farmers misfortune. I am temporarily out of queens until Tuesday the 18th. Over wintered colonies had been on a slow build up with many beekeepers not dividing the colonies. Now many of the same colonies that three weeks ago were just ok, now the populations have crept up and the bees are starting to hang out the front of the hive. This coming week the temperatures will be in the 80's and swarming will kick into high gear. Divide the colony, make a new colony with a new queen. This will lower the population but a beekeeper still has to look for swarm cells on a 10 day schedule. Divide the colony, leave the divide queenless for 24 hours. Add the divide on top of a package uniting them with a sheet of newspaper between the boxes. A 1/4" slit is cut into the newspaper. The bees will chew through the newspaper and as the hole gets bigger the bees will start going into each others boxes slowly getting used to each other.This will make the package much stronger and it will probably be a good honey producer. Switch the strong colony with a weak colony. Move strong hive A to the location of weak hive B. Weak hive B is moved to the location of strong hive A. When switching hives the whole hive is moved. The field bees fly out to forage and come back to where they think they live. The result is the weak hive gets stronger and the strong hive gets weaker. 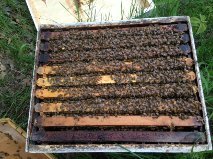 Swarm control is a must on overwintered colonies. Checking for swarm cells on a no more than 10 day schedule. Entrance reducers should be removed. 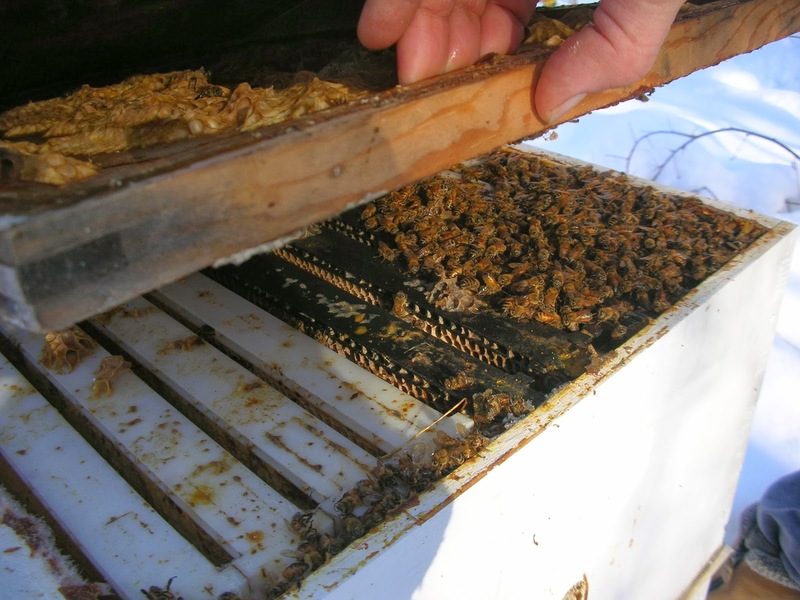 If a beekeeper is using a Varroa screened bottom board, the slide bottom should be removed. Any colony with a queen over one year old is much more likely to swarm than a colony with a new queen. All hives can swarm, overcrowding, hot weather, no pollen or nectar coming into a colony, poor air flow in a bee yard can contribute to swarming. 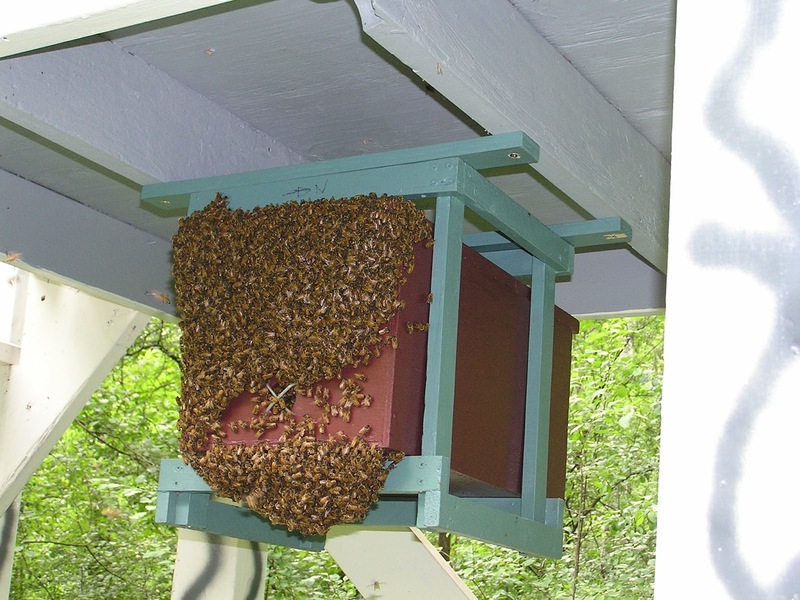 Now is the time to be diligent on swarm control. The nectar flow is on the horizon probably about three weeks out. This statement sums up swarming. Swarming leads to no excess honey in a hive. Swarm controlled leads to a bumper honey crop. The rainy weather has made pollen collecting a challenge for bees. The bees need the pollen to keep feeding their brood. No pollen and the brood can die and the colony moves backwards in colony strength. This time of year right after the fruit bloom there can be a dearth of pollen available for around two to three weeks. Pollen patty's are needed now to keep the brood well fed and the colony strength up before the main nectar flow hits. When checking the bees this time of year a beekeeper has to make sure there are enough food stores to get to the honey flow. Usually I pick up a brood box and judge by weight if they have enough honey. A heavy box means they are good for a week, if it is light weight I feed. I know someone that has some nuc's for sale. Anyone interested call or email me and I will pass on the contact info. I have heard of 6 beekeepers hit by bears this week. I myself was one of them. I have a yard at a non profit in Marine. They have a seven foot high fence around about fifteen acres. They grow vegetables in this site. My bees have been there for many years. Bears have always been in the area and I have never had a problem. Somehow a bear must have tunneled under the fence and found a tasty snack at my expense. The bear destroyed four of eight hives. Another beekeeper in south Maplewood also was hit. Bears are out there and if you don't have a bear fence they will happily share your bees with you. 10 days from hiving a package would be appropriate time to check for eggs. First delivery beekeepers need to check their hives for larvae and laying pattern. Second delivery beekeepers should check their hives on or around this coming Tuesday the 14th. If the queen is not accepted the bees will dwindle. A new queen will have to be introduced to keep the hive going.